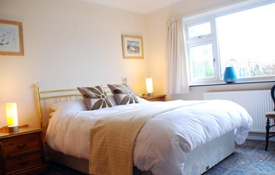 Pet friendly holiday in Poppit Sands, Pembrokeshire. Views over the Estuary. Beaches and walks locally. Sleeps 8 - 9 guests. Dogs welcome. 4 Knots, Poppit Sands - 3-bedroom luxury holiday accommodation with conservatory overlooking the estuary and near beaches. Sleeps 8 - 9 guests. Dogs welcome. Three miles from Cardigan, with its shops and supermarkets, Poppit Sands offers a large sandy beach ideal for smaller children with good boating and fishing available both in the Teifi river and its estuary mouth. Launching facilities are available at St Dogmaels where there are attractive river-side hostelries. The estuary is rich in bird-life, much of which is visible from the bungalow itself (egrets are regular visitors). 4 Knots, which offers pet friendly accommodation all year round, has 3 bedrooms each with en-suite facilities. The beds have Egyptian cotton sheets and towels are provided. 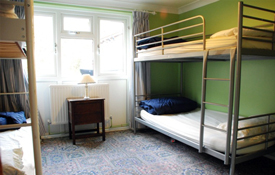 One bedroom has a double bed, another has a kingsize and a single bed, whilst the 3rd bedroom has 2 sets of bunks - very suitable for children. The entrance hall serves as the utility room where you will find coat hooks, shoe-racks, washing machine, tumble dryer, large fridge/freezer and the oil-fired boiler. 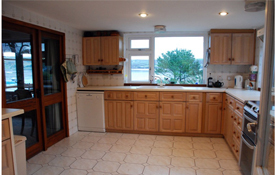 The kitchen is spacious and well equipped with an excellent view of the estuary. The living room has a large curved sea-facing sofa, dining tables, TV, HiFi and electric piano plus a wood burning stove for additional winter warmth. Outside there are well placed terraces with patio tables and chairs. 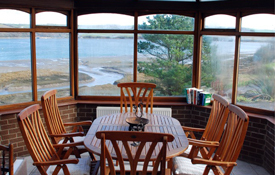 The bungalow has been designed to maximise the views over the river, estuary and the bay beyond with Cardigan Island in the middle distance. There is ample car parking for several cars adjacent to the bungalow. A single step leads into the entrance leading to a flat floor through the kitchen, living room and bedroom area; there is a small step down into the conservatory. The estuary directly below the house offers excellent exercise facilities for dogs of all sizes throughout the year (the beach at Poppit Sands does not welcome dogs during the summer season). The Pembrokeshire Coastal Path starts at Poppit Sands, 800 yards from 4 Knots and there are lots of other beaches (sandy or otherwise) within a short drive. The Webley Hotel is 50 yards from the bottom of the drive and St Dogmaels, a picturesque village with a Church and interesting Abbey remains together with a village shop, several Art Galleries and 3 pubs, is a short drive. Two bus services pass the bottom of the drive giving hourly access to both St Dogmaels and Cardigan and the Poppit Rocket, which serves the coastal footpath and Newport, runs several times a day, with connections to Fishguard and beyond in Pembrokeshire. The nearest train services call at Carmarthen, Clynderwen and Haverfordwest. Facilities for pets: Good selection of walks. Bed linen and towels included in price along with all fuels.